Jamie says: Oops… I forgot a great meal from our trip! Here it is! Better late than never. 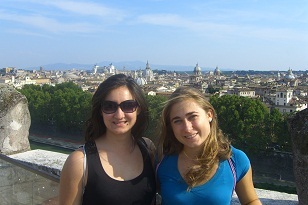 Kathryn says: After touring Doge’s Palace, our stomachs were grumbling. 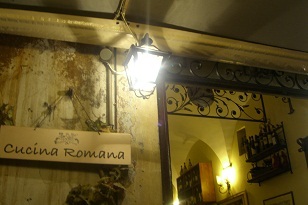 Just down the street, we popped into Osteria Ai Specchieri (Calle Larga San Marco 654 Venezia; tel. 041-523-7918) to give it a try. The owner was super-friendly and instantly befriended us. After he took our orders, he sat down at the table next to us to eat his lunch. 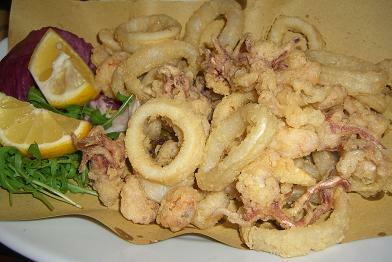 I got a delectable fried calamari, which was perfectly crispy, salty and lemony, and a side of polenta, which was plain but good when I drizzled olive oil on top. 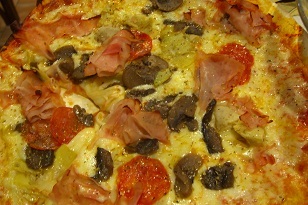 Mom got pizza with salami, mushrooms and artichokes, and she was kind enough to share it with J and me. 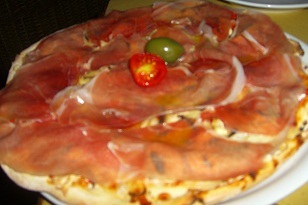 We were amazed by the flavorful cheese and toppings and found it to be our best pizza yet in Italy. J says: K was right! The pizza was quite awesome. It was hard to resist eating more of Mom’s meal. 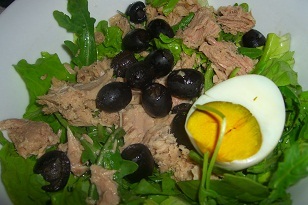 I really enjoyed my tuna salad, too. It was tasty and light. There was also corn in it again. Dad got the same thing and liked it, too. 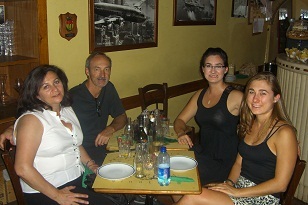 Jamie says: For our final dinner in Italy we decided to a restaurant from a street close to our apartment. Mom suggested we check out our options on the entire street before committing to a restaurant. Surprisingly, this was quite difficult since many restaurants caught our eye, but we followed Mom’s advice. 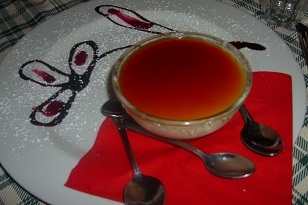 It was a good thing we did because we ended up choosing Mimi E Coco (near Piazza Navona, Via del Governo Vecchio, 72; tel. 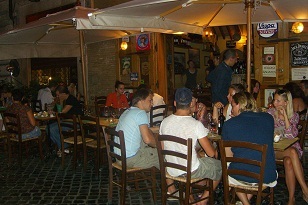 0668210845), a restaurant toward the end of the street. There were outdoor tables in the street and also indoor tables in the cute restaurant. We chose to dine inside this time- away from the disruptive street vendors who tried to sell everything from roses to laser pointers. The customer service at Mimi E Coco’s was one of the best we had during our trip. They brought chips to the table and, as a gluten-free option, brought a cup of green olives. I’ve never had olives like these; they seemed to be without any salt or preservatives and tasted so fresh. 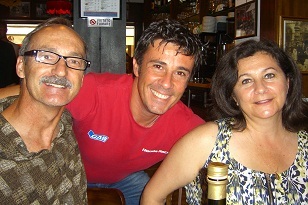 The waitress and owner were very friendly and engaged in conversation with us- telling us stories and asking questions about us. There were so many good options on the menu it was hard to choose. We ordered two margarita pizzas with mushrooms and pancetta (they also placed a green olive in the center of each). Pancetta covered the top of the pies and a generous layer of mushrooms lay below the pancetta. The crust was the perfect thickness- moto bene! I tasted one of Dad’s potatoes- they were really tasty, too. 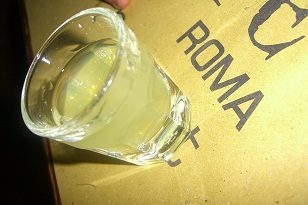 They brought us all lemonchellos, which was a treat since I had wanted to try one in Italy and I had forgotten, and toasted “chin chin.” This was the trip of a lifetime! Of course, after about an hour of shopping, I made my way to a gelateria for a mid-afternoon refresher. 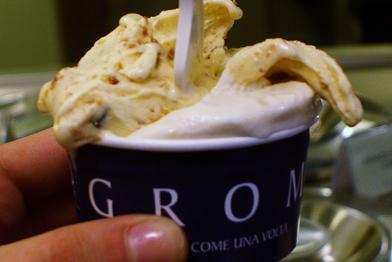 I went to Grom (Piazza Navona 1, angolo Via Agonale; Rome, Italy; Tel. 39 06 68807297; http://www.grom.it/ita/) I couldn’t really understand the menu since it was in Italian, but I knew it looked good, so I asked the server what he suggested and kind of winged it. 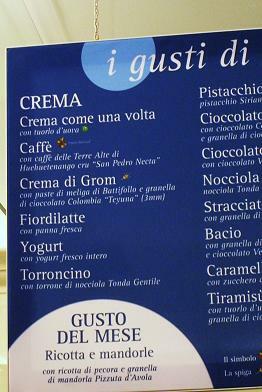 I ended up getting Crema di Grom, which tasted like vanilla cream, and Torroncino, which tasted like cookies and cream. Both fine choices. I sat by Bernini’s Four Rivers Fountain and savored the treat, which melted fast but tasted so good. I tried not to get any on the postcards I was writing to my friends back home, and I couldn’t resist telling them how I was enjoying a cup of Italy’s best dessert while writing to them. Jamie says: When I was little, I remember eating in Cinderella’s Castle in Disney World. That was about my only castle experience until now. 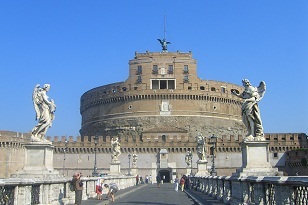 We were in for a real treat when we visited Castel Sant’Angelo after visiting St Peter’s Basilica at the Vatican. My Grandfather’s name was Angelo (meaning angel) so this castle had extra significance to us. We climbed the cool, dark interior of the castle with a destination in mind- a café for lunch. We had some “Stolarz luck” when a table cleared out right before Kathryn’s eyes. 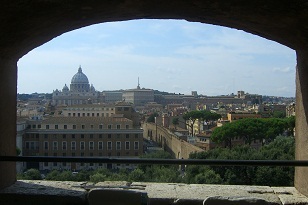 But it wasn’t just any table, it was one with the most beautiful view of the city and St. Peter’s Basilica. For lunch, we shared artichoke lasagna, swordfish with potatoes, and spaghetti with bacon. 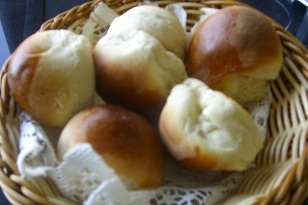 The table bread was very different than anything we had had in Italy before- lightly sweetened rolls. 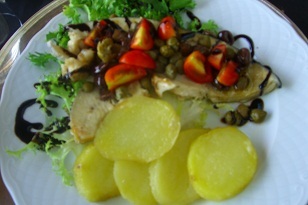 This was the first time I had swordfish. It was a thick fish and tasted alright (I remember reading it’s high in mercury, though). I was glad to have tried it but probably wouldn’t order it again. 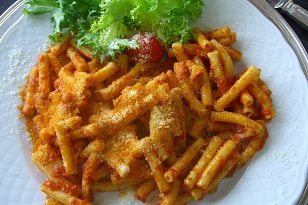 I liked the spaghetti with the red sauce and chunks of pancetta. Kathryn absolutely loved the lasagna. Kathryn says: Some meals are unforgettable, and this lasagna was one of them. It was so good that once I tasted it, I knew I wanted my own plate of it. Mom and J had eaten the other two-thirds of it since we had planned on splitting everything. So after taking a bite of the swordfish and spaghetti, I gave the rest to Mom and J and ordered another lasagna. 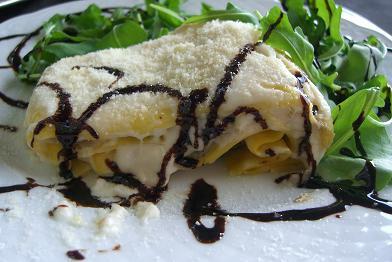 The layers of tender noodles, oozing mozzarella cheese and soft artichokes were topped with a fine powder of Parmesan cheese and surrounded by light, bitter arugula leaves and drizzles of a sweet balsamic vinegar reduction. The ingredients blended beautifully into an incredible orchestra of flavors. 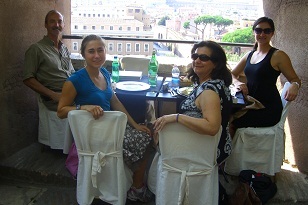 There I was, enjoying the best lasagna and the best view of the city sitting atop a castle with my dear family. 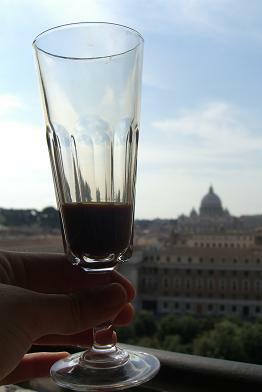 I also enjoyed a sweet, bold iced coffee in a fancy glass. I felt like a princess in a fairy tale. Jamie says: I woke up early and was ready for breakfast. 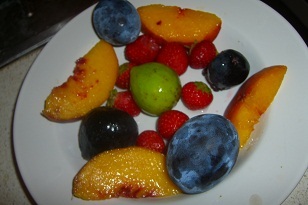 I made a fruit salad with peaches, purple figs, plums, and strawberries. 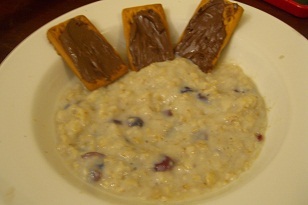 When Dad woke up, he started making a pot of his oats and offered me some. I contributed some dried cranberries to the pot which became nice and plump. To my bowl, I added two packets of skim milk powder I saved from the airplane flight, and topped it with three cookies (Campiello frollino) with Nocita (like Nutella) on top (I saved these from Hotel Maxim in Florence). I was surprised how much I liked the cookies and found another packet of two cookies (Colussi Gran Turchese from Hotel Diana in Venice) and another container of Nocita. Cookies for breakfast- yum! 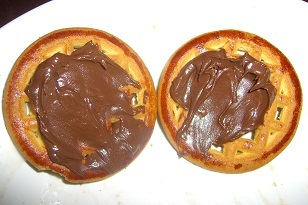 I’m thinking you could add that chocolate hazelnut spread to anything and it would be delicious! 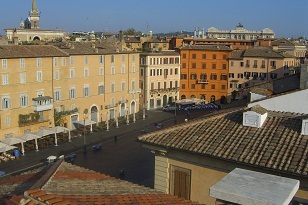 Dad and I then headed up to the “roof top” of our apartment to check out the view of our piazza, Piazza Navona. 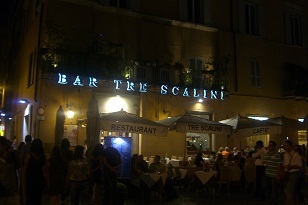 Jamie says: After falling in love with the tartufo I ate last night, I learned that the Rick Steves’ Italy guidebook recommended Bar Tre Scalini (Piazza Navona 28/29, 00186 Roma, Tel. 06-68801996) for their tartufo which, according to the guidebook, was “world-famous among connoisseurs of ice cream and chocolate alike.” K and I saved room for dessert (we barely touched the panna cotta at dinner) and sauntered to Bar Tre Scalini with 5 Euros in hand. 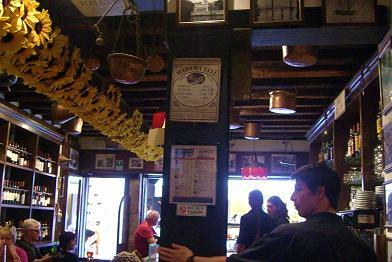 The restaurant/bar even had a sign about their tartufo that read something like, beware of imitations. We ordered our tartufo and the man at the counter topped it with fresh whipped cream and placed two heart cookies in it (he could tell we were sharing it). We brought it out to the piazza (Piazza Navona) and sat in front of the Four Rivers Fountain and enjoyed it. The chocolate ice cream was rich and firm and covered with a shell of chocolate. 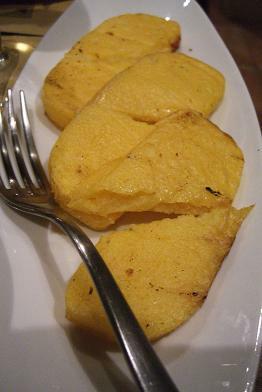 It had a slight hint of an alcohol taste that I remembered in the other tartufo. 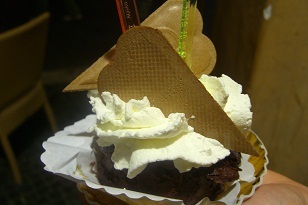 It was delicious and decadent- very similar to the other tartufo we enjoyed at Caffe’ Domiziano. I would have to disagree with these connoisseurs of ice cream and chocolate and say that the tartufo at Caffe’ Domiziano was my favorite; although, Kathryn would agree with these connoisseurs Rick Steves’ speaks of. 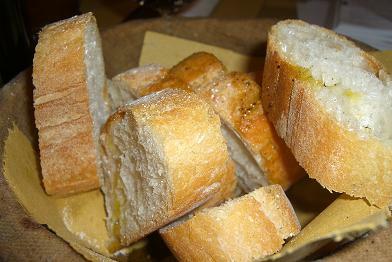 Jamie says: The streets of Rome were bustling as we searched for a restaurant for a late night dinner. 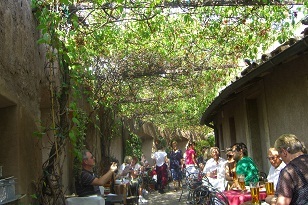 We found a nice outdoor restaurant in on a street/ally by our apartment in Piazza Navona. I was thinking, it’s so charming to sit at an outdoor table in the ally in Italy, but at home in the U.S., not many would even think of dining in an ally. I thought the name of the restaurant was Cucina Romana because there was a sign by door that said this, but I later discovered (by looking at the receipt) that the true name of the restaurant was Ponte & Parione Restorante-Pizzeria (Via S. Maria dell’ Anima, 62, Tel. 0668192278). 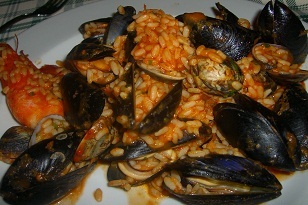 We ordered Risotto Pescatora (seafood risotto), Bucatini Amatricana (spaghetti with tomato sauce and bacon), Gnocchetti Vongole (gnocchi and mushrooms), Insalata Nizzarda (tuna salad), and Panna Cotta (caramel custard) . 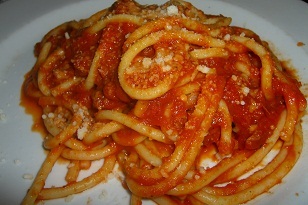 I enjoyed my Bucatini Amatricana with the thick spaghetti, red sauce, and especially the bacon. 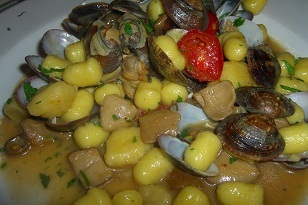 K thought the seafood risotto was ok. Mom’s Gnoccheti Vongole and Panna Cotta were not my style, but Mom loved them. 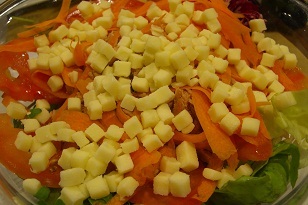 The salad was nothing special and looked mediocre (the egg looked bad). We reflected on our epic day, the highlight being climbing the 28 Holy Steps, the stairs that Jesus walked up on the day of his crucifixion, on our knees and reaching the top just in time for mass and then having a holy man of the church (a soon-to-be priest) invite a few of us to stay late and give us a private lesson about the steps. His one request at the end was that we each pray the rosary for him. I’m not sure if I’ve ever prayed the whole rosary, but after a moving experience like that, I was sure going to honor his request.